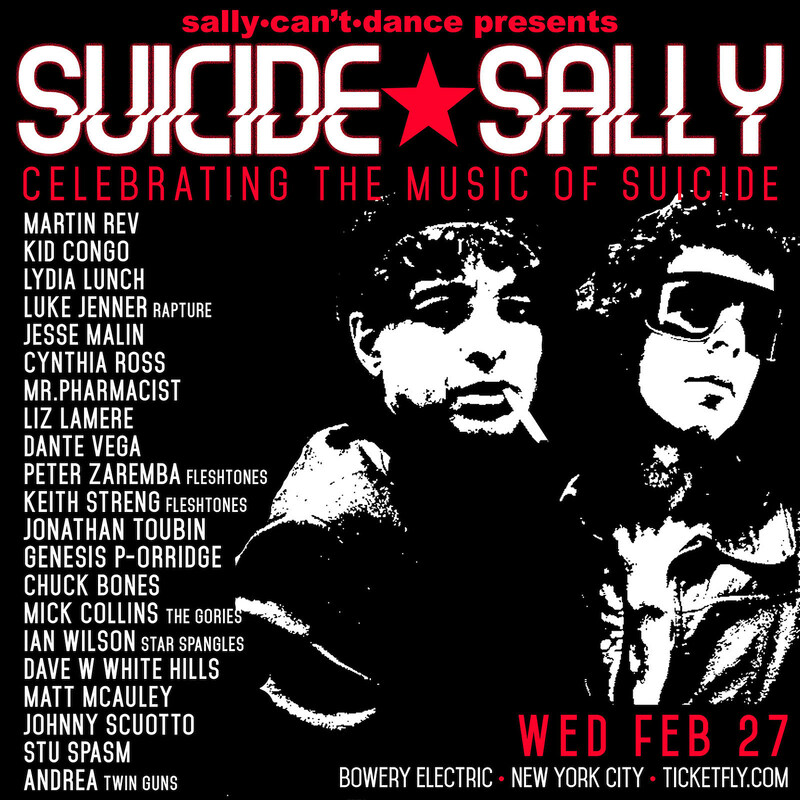 Sally Can’t Dance’s second annual tribute to Suicide and the late Alan Vega happens February 27 at Bowery Electric this year, and we’re now excited to reveal the stacked lineup, which includes Alan’s former Suicide bandmate Martin Rev, as well as Lydia Lunch, The Rapture’s Luke Jenner, Jesse Malin, Jonathan Toubin, The Fleshtones’ Peter Zaremba & Keith Streng, The Gories’ Mick Collins, B-Girls’ Cynthia Ross, White Hills’ Dave W, Star Spangles’ Ian Wilson, Mr. Pharmacist (aka Gregg Foreman), Alan’s son Dante Vega, and more. Kid Congo and Genesis P-Orridge are your hosts. Tickets are on sale. Full lineup below. UPDATE: Gogol Bordello’s Eugene Hutz was added to the lineup. The tribute show will also be a release party for a new limited edition Alan Vega 12″ single, Too Many Teardrops. It features one of Vega’s last recordings, “You Pay” (which was produced and co-written with Mr. Pharmacist), and it comes with remixes by Jim Sclavunos (of Nick Cave and the Bad Seeds) and Jim Thirlwell (of Foetus), with contributions from Nick Zinner and White Hills. It comes out March 8 via Jesse Malin and Don Dilego’s Velvet Elk Records (pre-order), but they’ll also have copies available at the show, with proceeds benefiting children’s music education programs.